You are unlikey to forget to arrange for photographs on your wedding, but have you thought where? Your ceremony may be in a beautiful church or hotel so maybe you are sorted. But a natural background of trees and flowers is always attractive. That's when it is a good idea to check out parks. Did you know that a lot of parks and places will turn you away if you haven't booked and paid a fee? So to avoid that on your wedding day, here's some information that may be useful. Please note it is essential to obtain permission before photography will be allowed. Popular parks for wedding photographs are: Bellahouston Park, Botanic Gardens, King's Park Walled Garden, Pollock Country Park, Queen's Park, Victoria Park. Botanic Gardens (Tel: 0141 26 1614) Parking:To retain the peace of the Gardens, there is no parking within the grounds but your permit will allow access for two wedding cars. The cost of your photo permit is £61. In Lanarkshire, Viewpark Gardens is immensely popular. One day we went and there were 4 brides - but don't worry , there is plenty of room for you all. Drumpellier Nursery is also lovely and you get the place to yourself for your timeslot. Colzium Park is also available. Hire of these parks for photographs is £45.82. You must book, in writing, at least 21 days before and pay the fee. 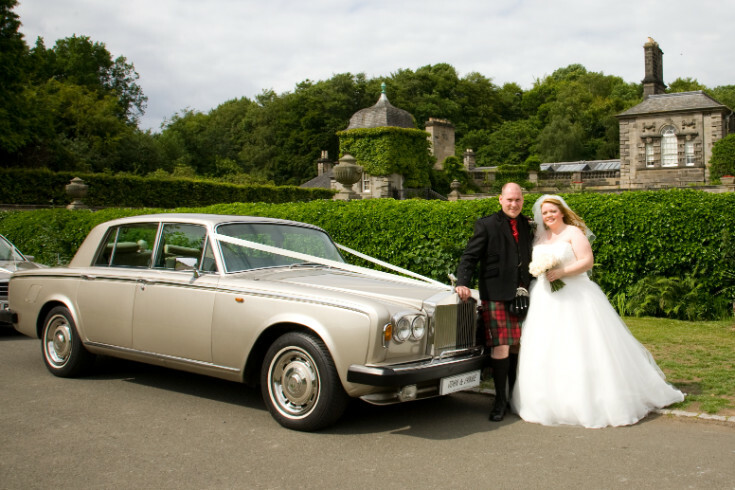 Other great photo venues are Chatelherault and Bothwell Castle, both near Hamilton. The fees for these are higher. 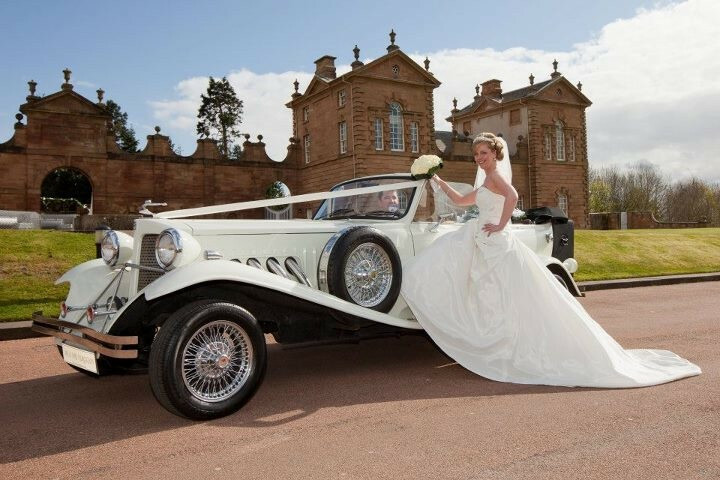 Debbie looking fabulous at her Beauford wedding car with Chatelherault in the background. There are other parks which are free like Strathclyde Country Park, Memorial Gardens in East Kilbride but it is alway worth checking out to avoid issues on your wedding day. Your photographer should be able to provide information as s/he is likely to have been there before.